And then there is also the Bowie Berlin. At least since David Bowie shared an apartment with Iggy Pop in Berlin Hauptstrasse for a couple of years in the late Seventies, there is a strong connection between the city od Berlin and David Bowie. In Bowie biographies the time is also referred to as The Berlin Years. I think I can cosider myself luck that I actually had the opportunity to see Bowie play live in Berlin – three times. So also for me personally Berlin and Bowie will always have that very special connection. Why / when / why did Bowie move to Berlin? As far as I know Bowie’s Berlin residence is closely connected to his prior time in Los Angeles – and his more or less heavy drug consumption. When he first moved to Berlin, he stayed with Edgar Froese of Tangerine Dream in an apartment in Berlin’s Bavarian Quarter. 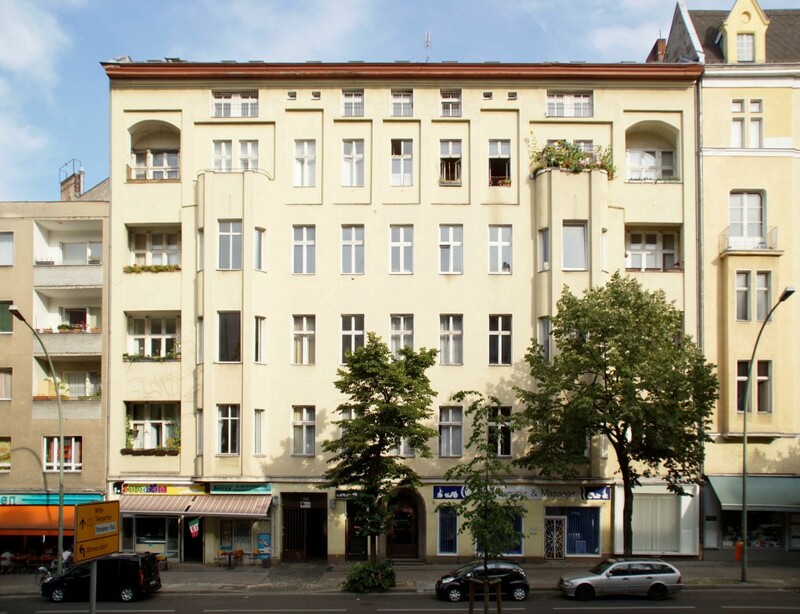 A little later he moved into a spacious apartment in Hauptstrasse, Schöneberg. David Bowie’s Berlin Apartment – „Hauptstraße 155 Berlin-Schöneberg“ by Detmar Owen. Licensed under CC BY-SA 3.0 through Wikimedia Commons Link. At that time the city was divided – Cold War was quite hot. Many people had moved away throughout the late Sixties / early Seventies and empty streets, bars and apartments offered a lot of free space for those who decided to move to Berlin. A special type of freedom inside a walled-in city. Bowie later explained that he so needed that off-time to find – to re-discover himself. In Berlin he had found the freedom, the emptyness, the time and space to go on a journey back to himself. Many Berliners however claim that it was his stay, that made them what they are today – and that he shaped the city, put it back on the map in times, when it was close to extinction. During his stay Bowie recorded three albums that can be considered a corner stone of his work – and a corner stone in music history: Low, Lodger, Heroes. All three albums were recorded at the legendary Hansa Studios, close to the Berlin Wall. During that period Bowie also co-produced / produced and co-authored two Albums for Iggy Pop: The Idiot and Lust for Life. In 1981 Bowie is co-starring in the movie Christiane F. – Wir Kinder vom Bahnhof Zoo / We Children from Bahnhof Zoo. The movie is based on the true story of Christiane F. Long story short: the teenage girl loses herself in West-Berlin’s drug scene – but she never loses her passion for the music of David Bowie. The soundtrack of the movie consists mostly of songs from the album Heroes. In 1987, the year Berlin celebrated its 750th ‘birthday’, Bowie gave a concert in West-Berlin right in front of the Reichstag building – right next to the Berlin wall. Around 60.000 people are attending the show on the west side. At the same time some 5.000 people are trying to get as close to the Berlin Wall on the east side so somehow attend the gig and at least hear some of the music. Some of the loudspeakers had been pointed to to east side – so the concert was quite well audible. The East German police were ‘of course’ not pleased at all and tried to stop the fans. People were shouting “Tear down the Wall!” / “Weg mit der Mauer!” – riots erupted, people got arrested. Today many consider this incident one of the many incidents that finally led to the Fall of the Berlin Wall. Later Bowie said about this concert: “It was breaking my heart. I’d never done anything like that in my life, and I guess I never will again.” (read the full quote and further details about that night here at theatlantic.com). In 2013, after not releasing anything for about ten years, on his 66th birthday Bowie releases the single Where Are We Now? (wikipedia) by ‘dropping’ it on iTunes. The song has some strong reference to Bowie’s Berlin Years. What are your thoughts about the Bowie-Berlin relationship? Please feel free to leave a comment below… Thank you!